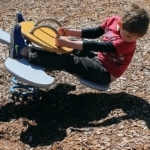 Current research backs up NSNS’s long-held value of the importance of healthy outdoor play. 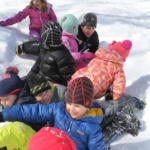 Our children venture outside every day in almost any kind of weather to take full advantage of the rich learning opportunities provided by the changing seasons and weather of New England. 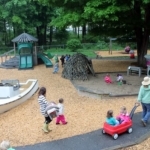 Our specially designed playground builds on the school’s existing woodland setting and uses organic inspired elements to spur imaginative play, sensory discovery and developmentally-appropriate physical accomplishments. 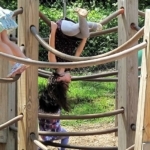 A free-form climbing maze of soft rubber tubes suggests a jungle setting or spider web that allows children to climb, hang and swing at a level comfortable for them. 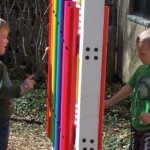 This helps them build upper body strength and develop balance, coordination and confidence. 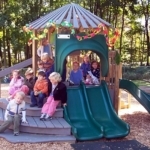 The toddler climbing structure is sized for two and three-year-olds and allows upper body development, practice with stairs, exploration and pride of mastery. 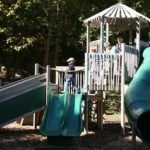 The high climber is a taller structure that allows children to view the entire playground once they reach the top via stairs, a ladder or a climbing wall. A quick ride down in the tunnel slide or tandem slide is a thrill for all. 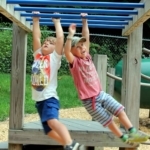 Swinging on the monkey bars is a fun way to build upper body strength. The children are motivated to hang and move across the bars and relish demonstrating their prowess as their ability advances. Meandering throughout the playground is a paved loop that provides ample space for wagons, tricycles, scooters and pedal cars. Children develop pedaling skills, strength and balance while traveling independently or with friends. 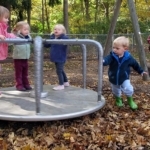 The merry-go-round enables children to enjoy their innate love of spinning while working on their vestibular development. The beaver hut is a twig-built shelter at one end of our generously sized sandbox that suggests a beaver dam or wigwam. 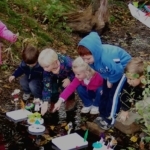 It offers a sense of enclosure that children love to seek out and inspires many group dramatic play themes. 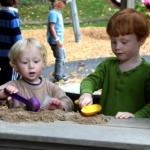 The sandbox counter is another popular feature in the sandbox. This “counter” suggests a lemonade or ice cream stand and encourages socialization as children concoct something for their peers. The car wash and gas pump encourage socialization as children pull in for fill up and to care for their vehicles. 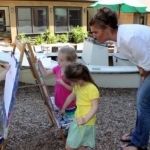 The lobster boat is reminder of the seaside area we live in and a favorite dramatic play element where children enact many sea-faring adventures. A wide array of outdoor tools and gear including child-sized rakes, shovels, wheelbarrows and sleds gives children a host of opportunities for “real work” and fun in any season. 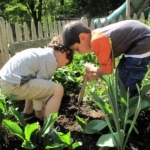 Our Discovery Garden, surrounded by a picket fence and raised beds in the entryway, provides an opportunity for the children to touch and tend a variety of perennials, sunflowers and the occasional pumpkin. The Discovery Garden boasts a rustic table and chairs for quiet activities and a dirt pit where children may dig, explore and hunt for insects and worms. What child doesn’t like playing with water? Our old fashioned water pump allows children to pump their own H20 for watering the flowers, mixing up playground soup or other wet adventures.